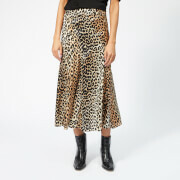 Marc by Marc Jacobs Women's Wool Twill Skirt. The indigo A-line style skirt features a single pleat front, closed slit pockets to reverse, khaki coloured waistband and belt loops. Finished with a navy blue belt with red trim and button fastening. - GG.